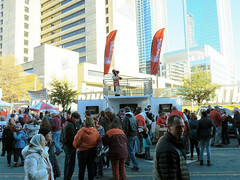 Chick-fil-A’s regional leaders for Charlotte wanted to offer the area’s franchise owners and operators co-operative an experiential marketing tool that would allow them the flexibility of operating as a Co-Op between themselves and the brand while still guaranteeing value and a maximum return individually. Boxman Studios and the Co-Op would need every owner/operator in the region on board, and would most likely need a prototype before committing to a full design, develop, and deploy project. 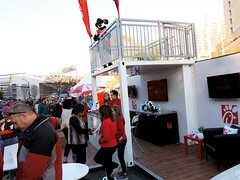 With the help of Chick-fil-A, we identified our Brew Cube (Super 10’) model for its expandable footprint, economic self-unloading system, and easy activation as a perfect fit for their experiential marketing needs. 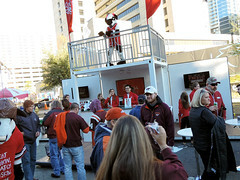 The Brew Cube is a Boxman Studios leasable asset, so it has already been upfitted with a refrigerated beverage dispensing system, a service bar, three TVs, an upper deck, a set of bar tables and chairs, and a whole lot of brandable area. We customized that branding with vinyl to create a big impact on a modest budget. 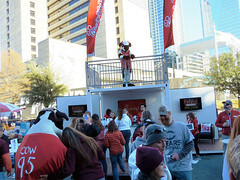 Together with the Chick-fil-A Charlotte marketing team, we surprised the owners and operators at their conference in the NC Music Factory. 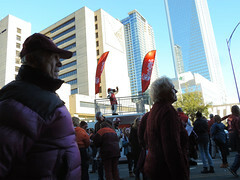 During a morning presentation to regional stakeholders, we fully activated the unit around the corner from the venue. 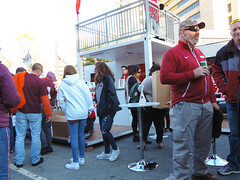 Once they broke for lunch we were prepared with ice-cold lemonade and tea, brand ambassadors, a Photo-Op, and an amazing example of how their activations could look and feel with a Boxman Studios Brew Cube instead of a nondescript tent- and in less time. 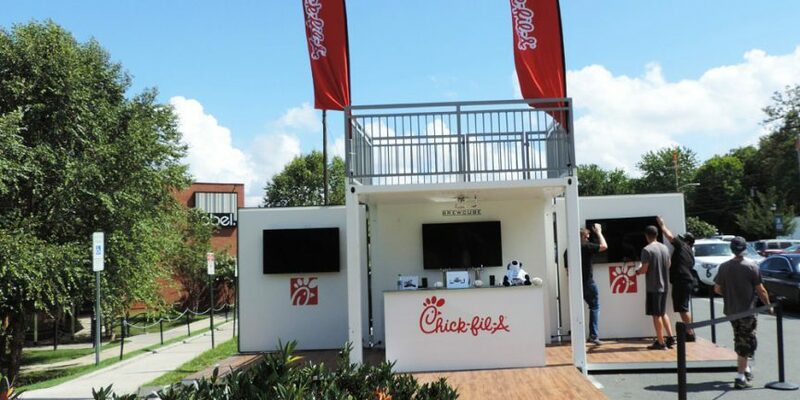 While the Co-Op interacted with the space and refreshed with their own product on a hot August day, Boxman and Chick-fil-A’s Charlotte marketing team explained the benefits of implementing an experiential campaign. 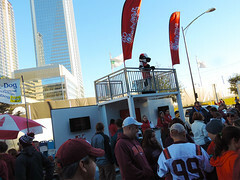 The Co-Op was excited to test the unit in the Charlotte market and experienced first-hand how this activation could pop-up at popular Charlotte metro areas, such as on Campus at UNCC and at the Belk Bowl. Sometimes you need to be the user of the product to fully understand the benefits it can offer! 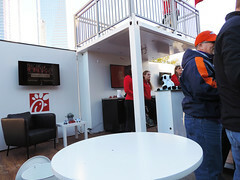 We are so grateful that Chick-fil-A gave us the opportunity to go from prototype to activation with them and complete additional pop-ups at Romare Bearden Park and at Fan Fest for the ACC Championship at Bank of America Stadium. 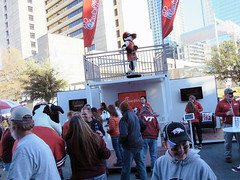 Check back later to see photos of more tour stops! Download A Beginner’s Guide to Building with Shipping Containers. A complete guide to every aspect of container architecture including specs, fits and finishes, pricing, transportation, and activation.